Please spread the word and help keep our pets safe this Halloween. People in spooky costumes and strangers showing up at the door can be nerve-wracking for some dogs. Halloween is right around the corner, and while you may be anticipating a night (or several) of delicious scares, your dog may not feel the same way. The thrill of spooky decorations and frightening costumes doesn’t translate to your pooch. What you see as fun he may perceive as a real threat. A fearful dog is at higher risk for running away, regressing behaviorally or displaying aggression. Minimize the risk of a bad trick-or-treat interaction by brushing up on your dog’s manners before the ghosts and goblins come to your door. Consider costumes carefully. Your dog’s costume needs to be properly fitted and comfortable, and he should wear it only when supervised to reduce choking or other hazards. Gradually introduce the outfit in the days before Halloween to give him a chance to get used to it, and pair it with rewards to make it fun for your dog. Keep in mind that not all dogs enjoy dressing up; Halloween-themed collars, leashes, toys or other accessories are easy alternatives to a costume. Trick-or-treat with care. Your dog may find it stressful to be out and about on Halloween; darkened streets, costumed strangers and crowds of people can be trying for even the calmest canine. 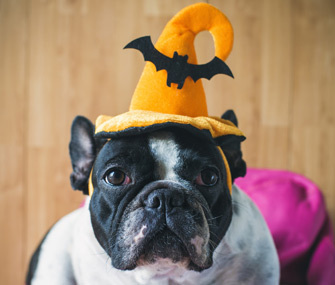 If you aren’t certain that your dog can be on his best behavior during the witching hours, consider skipping the door-to-door rounds and opt for a dog-specific holiday event instead. Brush up on greeting protocol. If your dog is curious about the ghouls and goblins at your door, help him stay calm and focused by asking him to hand-target or shake for greeting. This helps to make arrivals more predictable and gives your dog a controlled way to say hello. Always give him the option to stay at a more comfortable distance, too, and keep in mind that even a typically friendly dog may become upset by the coming and going of trick-or-treaters. Mind the door. To help prevent your dog from darting out the door, teach him to willingly wait when the door is opened. Work with him on an alternative behavior to do when the door opens, including “go to mat” or “sit.” For an extra layer of safety and good manners, use baby gates and keep your dog on a harness and leash when trick-or-treaters come to the door. This is also a good opportunity to make sure your dog’s microchip and ID tags are up to date. Create a dog-friendly space. If the constant flow of costumed kids is too much for your dog, excuse him from the festivities entirely and make him comfortable in a canine-specific area of your home, away from the front door. Gather his bed, toys, and food and water dishes in a room that can be closed off; play music or turn on the television if that helps. If the doorbell is upsetting to him, greet ghouls and goblins outside, before they have a chance to ring. And if your dog is extremely scared of noises, talk to your veterinarian to see if a medication may help. Prevent overindulgence. Candy can be dangerous — even deadly — for your dog. Store candy up high in a securely closed container. For counter surfing and food-stealing canines, extra barriers may be necessary, especially if you are distracted by trick-or-treaters or party guests. In addition, brush up on lifesaving commands ” leave it” and ” drop it” to help protect your pooch in the event he’s within range of forbidden food. What Makes a Dog a “Doodle Dog”? How Do You Really Feel About Halloween Costumes for Pets?